Early 1969 Les Paul Custom - Stephen from Virginia, USA. I have a 559xxx, Early 1969 Les Paul Custom. I found mine through a good friend at a garage sale. I purchased it from what may have been the original owner in southern Louisiana. I have had it since 2004. It's mostly original. The finish on the back of the neck was worn all the way to bare wood at some point. The previous owner had just the back of the neck oversprayed. He then played it again so much he began to wear through the new paint as well. Sadly, the original pickup covers are long gone. Factory, non-T, patent sticker humbuckers. It has early 70's, USA-made Nickel Grovers. It's missing some binding on the neck too! I didn't mean to. I didn't even know they existed! Just heard someone I knew had found an "old Les Paul Custom in an orange-lined case". I created it. :) I'm wondering if most of you found it through Google or through forums. I have been playing guitar since 1991. I am from Texas originally. I love every type of music from Metal to Jazz. Love the Rolling Stones and the Beatles. My first guitar was a used, 1986-or-so Kramer Focus 1000 for $150. Just wanted to say thank you for all the emails I have received. Very happy this site has helped so many of you make informed purchases. Follow this link to learn how this guitar inspired this website. 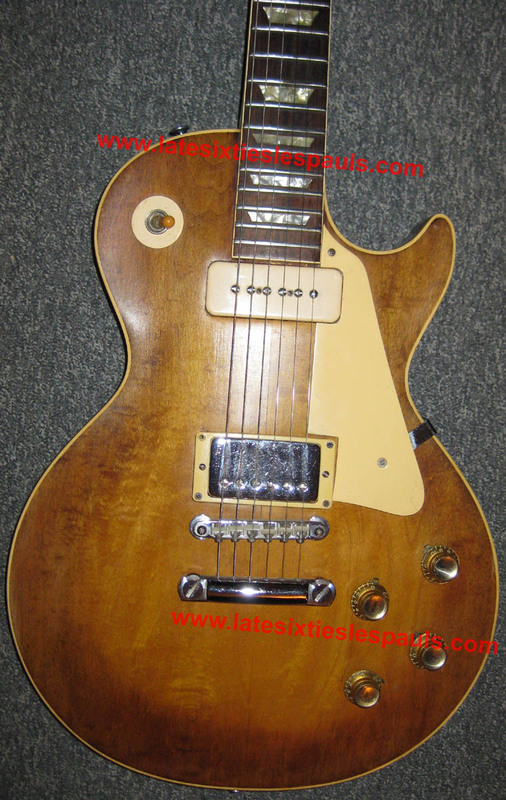 Early 1969 Les Paul Standard - Billy originally from Florida, USA. Traded it from a friend. 1 year. All original. Untouched solder joints. If I were to play it, 1973 50 watt Marshall. Been playing since 1975. Recorded and played with a lot people general public would know. Fla born. Rock mostly. First guitar was a 1975 natural deluxe. Bought used for $350. 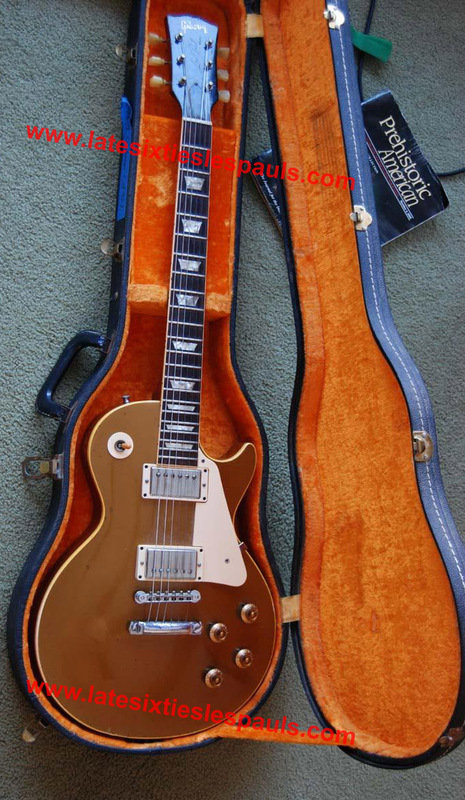 1968 Les Paul Standard - David from Sydney, Australia. Found through online seller via TGP, I have owned it for over two years. It has a number of mods, refinish (very well done even has pick guard shadow) as well as rewired ( I have also rewired it myself with CTS pots vintage wiring and real bumble bees) the tuners are original though it looks like it had Grover's on previously. I still have the originals but I have put on a Callaham stopbar tail piece and a metal jack plate. Main amp is a Lazy J 20, for larger gigs I use a Suhr Badger 30 as well in stereo....got a bunch of cool old amps as well for the studio ('65 DR, '65 Vox AC50, '73 Marshall SL, '63 Princeton) the goldtop sounds mighty thru them all! Wanted a player P90 guitar came across this at a great price cause of all the mods and yet it looks all original. David, been playing since 1972. From Sydney Australia. Muscular melodic pop would best describe the music I like, bands / performers like Jellyfish, Badfinger, Owsley , Jason Falkner etc, digging "the Union" currently. My first real guitar was a 1969 Gibson SG which I foolishly sold...trying to reclaim it could be costly but...in the process wish me luck! Early 1969 Les Paul Custom - Nick originally from London, UK. Bought from a dealer I have known for many years. Had it now for about 12 years. Original (to my knowledge!) One piece neck/body and long tenon. Because I didn't have one! Nick. Been playing since the 1960's. From London originally. Worked in Macari's Musical Exchange, Charing Cross Road and Denmark Street during the late 60's and 70's. Blues, 60's and 70's Rock. Peter Green, Rory Gallagher, Freddie King, the other Kings, Otis Rush, etc etc etc. First Guitar was a Futurama. Modified/ routed for humbuckers. Currently has old set of T-Tops. I do play this. I have a modded Carvin VT-50 head(Hasserl stage 2 (B) mod). Thru a 212 cab. 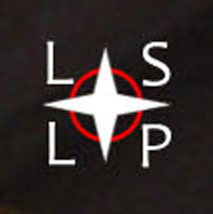 This one I credit to LSLP site. [EDIT: See Featured Guitar #2 for more info on Billy.] -- Tom Petty & the Heartbreakers, Blackfoot, George Clinton, Jimmy Farrar, Bo Diddley. Small headstock. 50`s neck. Partial refret. Early 1969 Les Paul Custom - Dave from California, USA. 1969 Les Paul Custom - s/n 559xxx Early Reissue. Purchased online within the past month from a direct seller in non-working condition. She's highly modified - routed for a tremolo, currently is a Kahler 2700 but it's had many others in it's past. Locking nut installed. Original parts are cavity covers & pickguard - everything else is non-original. Just got her back to playability - my current amp is a Fender. First name is David and I live in California. Been learning guitar for a few years now - I work on them as much as play them and am by no means a professional. It started with a Charvel Model 6 a decade ago that a long-unseen friend had given me. I've reconditioned probably close to 200 guitars now, - of which have been Gibsons. I prefer modern and classic Rock - favorite bands are Rush, Zeppelin, Floyd, AC/DC, etc. 1968 Les Paul Standard - Pierre-Alain from Switzerland. Modified. I changed the bridge pickup in a Humbucker PAF I've found in London in 1971 for more distortion, Grovers Mechanics, color in Sunburst. Vox AC 30 1964 but it's to loud and heavy now. I play mostly on a little Peavey Classic 20 with a Marshall 1 x 12". Because of Michael Bloomfield, Eric Clapton, Peter Green and others usual suspects I've heard on LPs in this years. Amazing sound. Search on Google "Les Paul 1968". My name is Pierre-Alain, I play guitar since 55 years, I live in Switzerland. Blues and Rock and I still play in several bands . Jeff Beck, Hendrix, Rory Gallagher, Eric Johnson and many others. An EKO 500/2 in 1963 and I still have it. 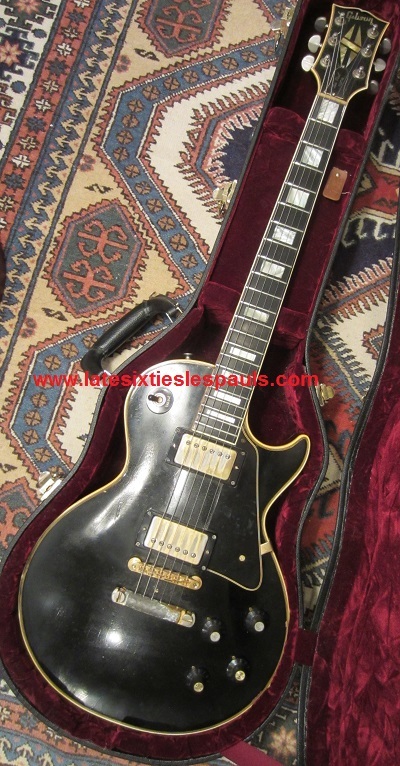 Early 1969 Les Paul Custom - Anthony from Australia. 1969 Les Paul Custom . 539XXX. I found it in a guitar shop owned by Chris Kinman( later he started Kinman pick ups) in Brisbane, Australia in 1991. Very modified ,it has been refinished and it had the neck joint shaved. It is stable and it feels comfortable playing up there. [EDIT: Note also that the binding edge was rounded and binding removed on the rear.] It's also had a new Montreaux time capsule tail piece, a Tone pros bridge and Grover tuners. On a positive -the wiring apart from 1 pot is all original as are both the pick ups. Either a 1962 Vox AC30 Top Boost , 1953 Fender Champ or a 1962 Blonde Bassman. I was born in the late 60's and you have to have a guitar from the year you were born! 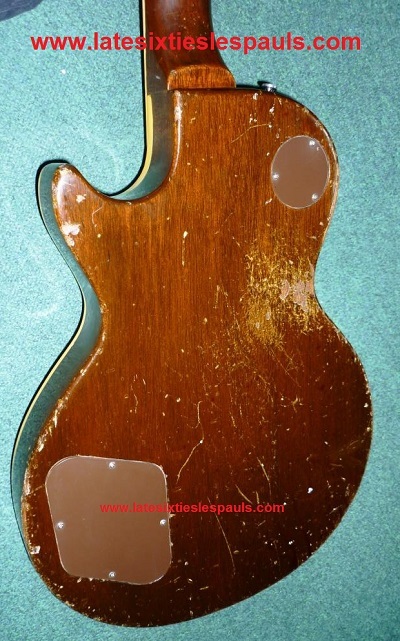 I found out about latesixtieslespauls through a couple of Les Paul forums. I have played guitar since the mid 1980's. I am from Australia. I listen to all sorts of music but lately Gary Clark Junior gets played a lot. The old stuff , Bob Marley , The Beatles , The Rolling Stones and The Who and of course Led Zeppellin. As for new music - Kanye West and Eminem, I better stop now, Haha. My first guitar was a 1972 Fender Telecaster. I wish I still had it. 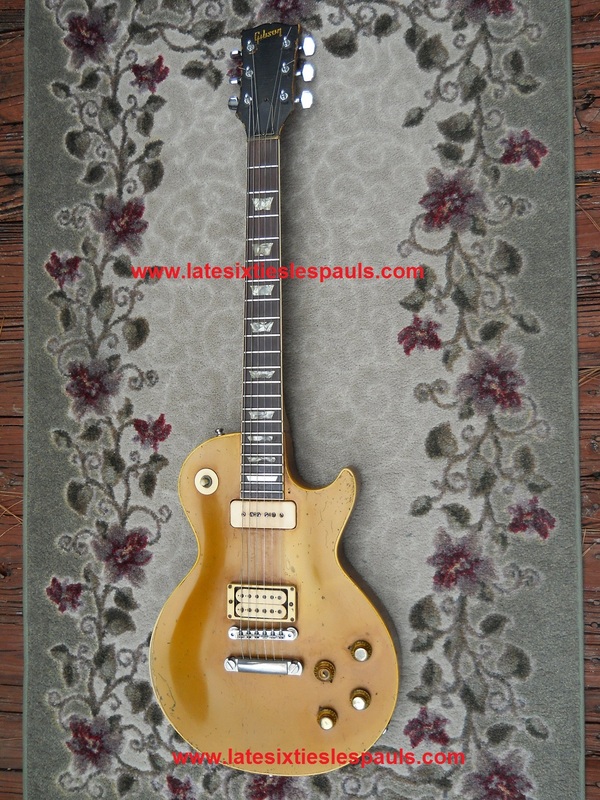 Middle 1969 Les Paul Deluxe - Mike from Florida, USA. My friends were getting tired of me always asking to borrow their Gibson guitars for party/gigs, so I saved up and bought my own. I saw this site mentioned several times on the Les Paul forum and thought I better check it out. Mike, & I live in Florida. I started playing guitar in 1979 at age 11. 1970's classic rock is what I like more than anything, lots of great sounds and riffs. My first guitar was a Fender. Middle 1969 Les Paul Deluxe - Jeremy from the UK. Bought from a UK shop "Electric Ladyland" in Bristol fairly recently. 1968 Park Plexi 50w and 4x12 cabinet. Jeremy. UK England. Been playing for 39 years. All types of music, Rock, Blues, Folk and Classical. Tom Petty, Stones, Beatles etc.